Combo Pic is another entrant into the “Pictures = Words” genre. One of the most intriguing things about this game is that it goes with a 2 pictures concept that makes each level, no matter how low, a challenge. 4 Pictures might tend to give you easier hints and make things repetitive or help breakdown the larger word clues. Combo Pic keeps things nice and tight in tandems and the completion of each level for me, was that much more enjoyable. I don’t like to stare at my computer screen trying to sleuth out the word, but when I do, you can bet that I’ll smile and happily move on to the next level. This might not be a good fit for you, if you don’t have some free time to play and are trying to solve the puzzles on-the-go. Some of these levels will require a small amount of your time and it’s not an ideal situation if you are trying to multi-task. Some of my favorite things about this app are the interesting level packs. Lots of great clues and pictures that get the brain juices flowing. 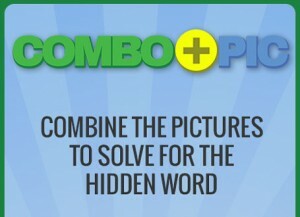 Combo Pic for iOS devices at the App Store. Combo Pic on Facebook for desktop and laptop users.